Another reserve game, another double for Louis Dennis. He’s developed quite a penchant of scoring for Jake Wigley’s side this season. Yet again the forward underlined his quality, this time helping put AFC Bournemouth under-21s to the sword at their Canford Arena training ground. A second-half double from Dennis and a goal from Adam May inspired the Blues to a 3-0 victory against the Cherries. The former non-league ace moved his tally for the reserves to eight goals in seven appearances. By anyone’s standards, that’s a fine record to boast. However, it hasn’t been enough for him to break into Kenny Jackett’s starting line-up during the League One promotion push. The 26-year-old has featured just once in the division this season after his arrival from National League side Bromley last summer. On that solitary occasion he caught the eye, provided the assist for Brett Pitman’s consolation in the 2-1 loss at Oxford on January 19. Dennis’ seven other first-team appearances have been in the Checkatrade Trophy and FA Cup respectively. And to add to his frustrations, he was dropped for the semi-final and final of the Trophy triumph, despite being key in previous rounds. It’s no doubt been a disappointing campaign on a personal front for the ex-Dagenham man. He’s held in high regard by his team-mates, with Anton Walkes heaping praise on Dennis after the Bournemouth win via Twitter. There was also the training footage Danny Rose posted on social media nutmegging David Wheeler which left viewers mesmerised, while a place on the bench in place of James Vaughan against Rochdale shows he’s rated by Kenny Jackett. In truth, there can’t be many players in League One who have been unluckier than Dennis. The quality of his performances in the Checkatrade Trophy and his goalscoring prowess for the reserves would warrant ample opportunities at most third-tier sides. 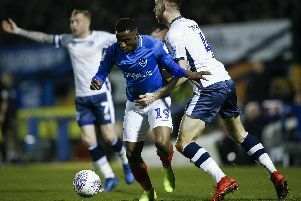 But because of Pompey’s potency in attack, with players the ilk of Brett Pitman, Gareth Evans, Jamal Lowe and Ronan Curtis, it's made it near-impossible for Jackett to hand him a start. The Blues have plundered 75 goals in the league so far, the second-best tally in the league. Loan players such as Andre Green, Viv Solomon-Otabor and Omar Bogle arriving from the Championship has also made Dennis’ task of winning a starting berth even more difficult. To his credit, Dennis has continued to plug away and kept on impressing as he seeks a breakthrough even at this late stage. And if he does get a chance, his form suggests he’ll not disappoint.